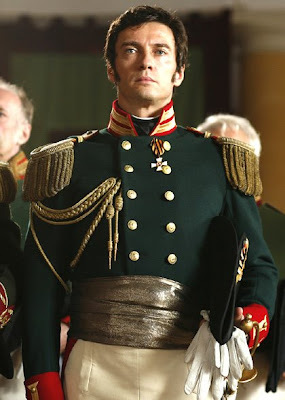 This week I watched the 2007 TV miniseries War and Peace with Clemence Poesy (Fleur in Harry Potter and the Goblet of Fire), Alessio Boni (be still my heart...), and Alexander Beyer. 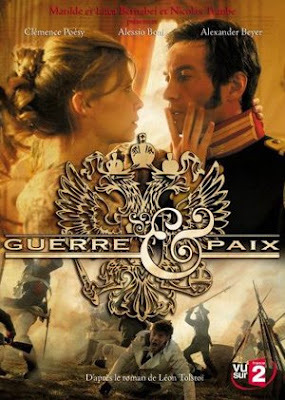 I have to say that this is one version of War and Peace I loved. I tried to read the book when I was in Argentina, in an attic with a flashlight, and frankly it put me to sleep. There's a good chance that reading it now I would be hypnotized. But the problem with the book is that it's slow and long. So very long. (I know, I know - heresy) This is not to say that the story is not good, because it is. Nor am I saying that the characters are uninteresting, because they are. It just kind of drags on for about 1000 more pages than I would have liked. This is when I turned to the movies. There are two, I believe. One too boring for words, and one that I like a lot with Audrey Hepburn and Henry Fonda. There is only one little, tiny, insignificant to most, but vitally important to me, issue with it - the guys are not exactly eye candy. I know it's superficial - sue me - but I need to be able to get behind the characters and fully accept them as the heroes the writer wants me to believe they are. When the character is not good looking enough for the kind of passion involved, it becomes unbelievable to me. Audrey Hepburn passionately in love for 1000+ pages with this guy?... I don't think so. Now, Clemece Poesy passionately in love with this Italian God... now that I get. All in all I would say that both book-to-film adaptations bring you into the story and take you on a journey to places unknown. 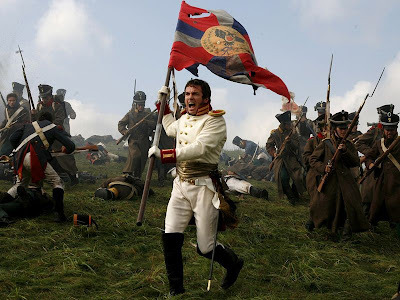 There are beautifully romantic moments, moments of bravery and passion, moments of malice and evil, seduction of the innocents, tyrants, friendships, moral issues, and of course war, that make up this magnificent story. If you haven't read the book, or like me, had a difficult time (okay, I was 16yrs, so maybe I have to give it a shot now in my more advanced age), then this series is for you. There is this amazing moment when Prince Andrei and Natasha dance the waltz....I love it in those movies of olden days when there's that moment on the dance floor when everyone else fades away, and it's just the two of them twirling and spinning and laughing. There are of course others there with them, but they are irrelevant. It's a perfect Saturday afternoon movie. I recommend that this activity include tea, popcorn and maybe even a few cucumber and radish sandwiches - but maybe that's just me.